No Aulton penguins were harmed in the making of this comic. This planet is going on a short, three hour, tour to another part of the solar system. Please be sure that your seats are upright and your tray tables are in the upright and locked position, Please check your safety belts and remember that there are flotation safety devices under you seat in case we land in a watery grave. Seen from this tiny ship. The skipper cloaked and sharp. Aulton would be lost, Aulton would be lost. The thought of the fuel that must power those rockets, where it was stored, and the effects of that significant loss of mass to the planet, staggers the mind. And that’s before taking into account the change in momentum and so forth affecting the orbit of the planet around its star. It’s okay, it’s a Spacetrawler engine. Well, not “okay” okay, as is it still powered by a couple hundred Eebs, but details. Antimatter thrusters, maybe? … actually, does the G.O.B. *have* antimatter? Is that a thing that’s been established at some point? You don’t keep quadrillions of kilograms of antimatter on a planet that has universe-savingly important things on it. My guess would be a monopole-catalyzed-total-conversion photon rocket of some kind. Hopefully a kind that doesn’t have a planet-destroying failure mode. Assuming that they were in a stationary point in orbit above the planet, wouldn’t they be locked in the gravitational well of the planet? And wouldn’t they therefore move with the planet when it moves? Maybe not in the exact same point since the planet is changing it’s position from the pole, thereby moving out of the elliptical plane of the solar system? I know it’s just a comic, just pondering how it would work in the physical universe. For our physical universe, a planet can’t just move without conservation of momentum. If you’re using propellant, you have to expel a lot of mass or get it away very quickly. Either way the center of mass is going to remain constant. Something far enough out would keep orbiting that same center of mass. When it gets close to the same separation as the planet and propellant, it’s a 3-body problem and things turn chaotic. It could get dragged along with either the planet or the propellant; it could also get ejected on its own. Since the ships here work on principles like slipping between light particles and riding darkness, of course, I’m sure there are other considerations that make this work exactly as shown. 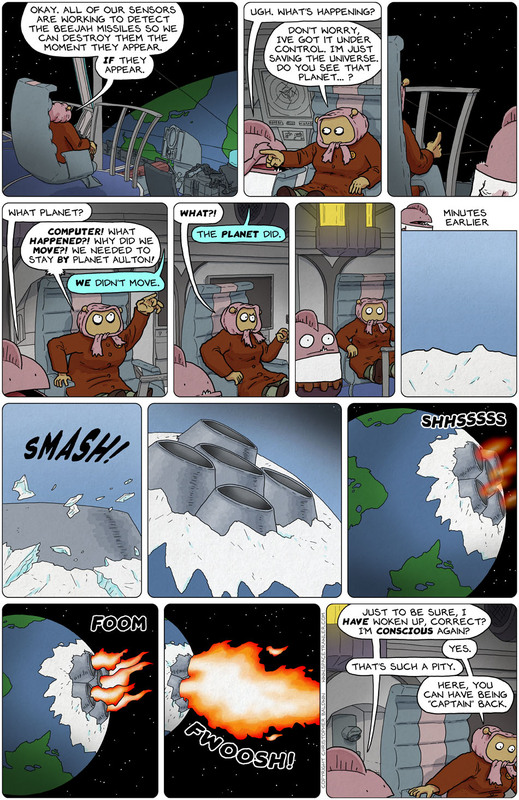 Since Aulton was made in the Spacetrawler era, do I want to know how many Eebs are driving that planet? Old-fashioned spaceships have to move between orbits using thrust, and need to orbit or fall into the planet. Real futuristic spaceships with total gravity control can just pick a point in space near a planet and sit there. Gravity would still affect it, but it would be ignoring it. I suspect this is one of those kind of ships. In the face of a planet moving *really* fast on thrusters the size of continents – who wants to be captain? Free captain’s chair! Any takers? Yes?… no? Looks like no. THAT’S IT! If I cared at all about the physics in this comic before, I’ve officially stopped as of now. What’s the reaction mass? The planet’s core? WHO CARES!! I was cackling like a fiend as I wrote that… It’s all good, the story’s always what mattered to me. Well that and the humor, which is also solid. What, only NOW do you have a problem with alien physics in this strip? Take two seasons of Dr. Who and call me in the morning. We got planets that are computers, planets that are monster eggs (see recent season of Dr. Who for THAT one, too). Planets that are spaceships don’t take much of a leap. Larry Niven hauled the Earth out to Jupiter. James Schmitz flew the planet Karres around a galaxy using witchcraft. Heck, we might wake up some morning with a shiny new planet in our own solar system. That should knock some of the crap headlines out of our newspapers. “When Worlds Collide” both movie and several novels! So it’s kind of, “Better a reduced, possibly-unstable planet than none whatsoever”? Also, that tech… it’s rather mind-boggling. Certainly possible but very, very, very difficult. Moreso than the Schlockiverse “light a two-ended plasma candle and shove one end deep into a gas giant” thing. That looks like a reaction drive — so it’s no spacetrawler. No Eebs in the piping. Newtonian physics and questions of fuel aside, Aulton just demonstrated — if, in fact, the planet itself and not a human-scale operator is responsible — that it can a) detect missiles that are cloaked, b) activate its reaction drive and c) move out of the way — possibly to a safe distance, which it might also know, therefore d). Planets, at least those within the scope of my purview, do not act so on their own. Therefore there’s an agency at work — past, buried in programming, or present, ditto or possibly living. What this might mean to the kreebrick at this time is, of course, impossible to know. Think I’ll get some more popcorn before we find out. Not all planets though. There were some that the crazy Eebs destroyed. Although I think they merely scorched them, which might’ve been fine with the planets. Unpleasant, but so’s an anthelmintic therapy. Impressive startup time for engines that were last used … never?